Cheap RC Airplanes - Good or Bad? It seems there are lots of 'cheap' rc airplanes around these days, but you have to be careful with what you're buying. Well, any Ready To Fly (RTF) rc plane that can be bought for under $100 can be put into that category, but these days you can buy an electric RTF airplane for around half that amount - now that is cheap! The danger of course is quality; as with everything in life the phrase "You get what you pay for" is equally true for rc airplanes - buying a $20 rc plane off eBay, shipped over from Hong Kong, could be asking for trouble. So, it's always best to stay with a reputable manufacturer - the few extra dollars buys you a lot more peace of mind. That old saying "You get what you pay for" is certainly true in the radio control flying hobby! Cheap rc airplanes have an obvious advantage if you're on a tight budget, but they also provide an excellent way of trying the hobby for not much money, and this is great if you're just testing the water and you don't yet know if you want to take the plunge with a more expensive airplane. Above: cheap planes like these make a great intro to the hobby. Rapid advances in rc technology in recent years have made cheap rc planes available from a large variety of suppliers; it's very common now for such planes to be sold in small toy shops and not be restricted to specialist model shops. When I was a kid, back in the late 70s-early 80s, buying a fully functioning RTF rc airplane from a local toy shop, with my saved up pocket money, just wasn't possible - I wish it had been! So it's good that such planes are now so widely available. 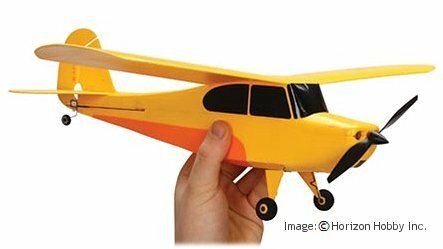 The majority of cheap rc airplanes are of foam construction so are very durable, and the better manufacturers such as HobbyZone back their planes up with a complete range of spare parts, also sold at very little cost. Well, as with anything it's open for discussion, but I would certainly put the little HobbyZone Champ at or certainly near the top of the list. It's been a hugely big seller, and many members of my forum cut their teeth on the Champ. The Champ is around the $100 mark so it's not the cheapest of cheap planes, but it is one of the best quality. And it's backed by Horizon Hobby's excellent customer support, and a good range of spare parts. It's a high-wing trainer configuration, and has 3-channel control to motor, elevator and rudder. Perfect for self-teaching on a budget! Well, yes and no. It's understandable that the cheaper rc planes are going to be smaller rather than larger and, again, this is where you have to be careful. If you see a 2 metre wingspan RTF plane with a price tag of $50, then it's likely going to be junk. But a 30cm span plane with the same price tag is more realistic. But should you go so small? Well, there are pros and cons to micro rc airplanes and some are actually OK for beginners, like the Champ shown above. But as a general rule of thumb with radio control planes, bigger is better. They're easier to see, and the extra mass of a larger plane helps to stabilise it in the air, and this is always a good thing when you're learning to fly. Your size of flying area is also going to determine what size plane you can get, so if your space is limited then a smaller plane is the perfect solution; not only will it get you in to the hobby for not much money, it will also let you fly in a size-restricted area. If you want a true taster of the hobby, without getting too involved, you really need a 3-channel plane with control to motor, elevator and rudder. Some cheap rc airplanes are likely to give you just 2-channel control (motor and rudder) and while this will give you a taste of flying a radio controlled plane, such planes are very limited in what they can do. Forget about the planes that have twin motor control and nothing else - these really are toys more than anything else; great for the kids, but not so great for a serious introduction to the hobby. Such planes typically get their directional control from changing one motor speed in relation to the other, and their height control by changing both motor speeds together. Again, a 3-channel plane will give you the best experience and fortunately there are many out there to choose from, the little Champ being a prime example. So hopefully this page has given you a bit of background info on cheap rc airplanes, and what's available to you. Please do be careful and if you see a plane that seems too good to be true for the price, then it probably is!